LAHORE, Feb 25 (APP): Federal Minister for Planning, Development and Reforms Prof Ahsan Iqbal said on Saturday that foreign policy of a country was based on its national interest and Pakistan woould have to maintain its relations with the USA keeping in view the current regional situation. 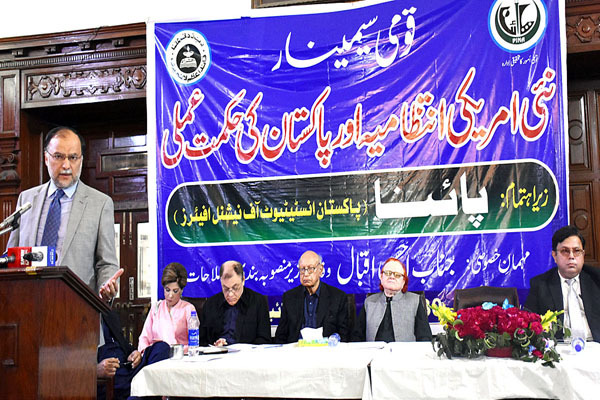 He expressed these views while speaking at a seminar on ‘New American Administration and Pakistan’s Strategy’ organized by Pakistan Institute of National Affairs (PINA) here at Quaid-i-Azam Library. PINA President Altaf Hassan Qureshi, SM Zaffar, Sajjad Mir and other prominent personalities also spoke on the occasion. Ahsan was of the view that Pakistan and other countries had no option about Donald Trump, who is now elected President of America. Keeping this fact in view, Pakistan will have to reassess its policies to continue with its relations with the US under new administration of Donald Trump. There was no permanent friendship or permanent enmity in foreign policy since it based purely on national interest of respective countries, he said, adding that US and Pakistan have commonalities in their national interests and policies as both want elimination of terrorism, ISIS and establishing durable peace in Afghanistan, therefore, both can move forward in this direction. He said job creation was another priority of the US government and Pakistan could play its role in development of American industry while becoming part of its high chain supply and value addition on win-win basis. Pakistan should attract major US companies by ending the policy of traditional thinking and sentiments and formulating foreign policies based more on economic development, he said and asserted that it would also promote trade diplomacy between the two countries. Ahsan mentioned that Donald Trump had also expressed his resolve to improve further relations with Pakistan during his telephonic conversation with Prime Minister Muhammad Nawaz Sharif as well as with Pakistan Ambassador in America. This message, he hoped, will give new direction and impetus to Pak-US bilateral ties. The minister said the US had always been remained a ‘knowledge economy’ and its universities had greater impact on the global economies, citing that Japan, Malaysia, Iran, Russia, China and many other countries managed to rank themselves in the developed countries by taking optimum benefits of knowledge from US varsities. He mentioned that first time in history of Pakistan, Prime Minister Muhammad Nawaz Sharif announced a comprehensive programme for Pakistan students to get admission in US varsities in various fields. This programme will definitely jack up Pakistan economy, he added. Ahsan Iqbal said the 20th century had been the century of political concepts but the 21st century was of economic ideology. Only that country can advance at global level that has an ability of wealth creation; its justified distribution; and efficient in ensuring its sustainability on competitive basis, he added. To change destiny of 200 million people of Pakistan cannot be done overnight, as it required years, he said and added that present government was striving to ensure social justice; level playing field and equal access of everyone to opportunities, as it was the vision and ideology of Quaid-i-Azam and Allama Iqbal regarding Pakistan. The minister mentioned that three years ago, the western media and global institutions had been terming Pakistan as dangerous state but today the same media and institutions were all praised of Pakistan and declared her as rising economy in the world. He cited that now European countries, Central Asia, Russia, Saudi Arabia, Iran and UK etc were eying Pakistan and showing their keen interest to be part of the CPEC (China-Pakistan Economic Corridor). Ahsan Iqbal said opposition parties creating hue and cry against federal government just for political point scoring, could not bring forth even a single scandal of corruption against the PML-N government, which has since its inception been executing developmental projects worth billions of rupees. He added that these opposition parties, however, failed to eliminate corruption in the provinces, where they have in government.